This chapter is an intensely personal one for me. Like anyone who has ever lived there, I remember exactly where I was – sitting in my car at an intersection I was at daily on my way home from work – when I heard the news of the earthquake on the radio. As soon as I heard the magnitude, I knew what the number 7 meant. I looked at the Getty station on the corner where I was waiting for the green light and imagined it crumbled. I knew that many buildings I knew, loved, had been in, had lived, studied, and worked in had been destroyed. I knew that people I cared for, had taught or studied with were gone. I was not prepared for this. 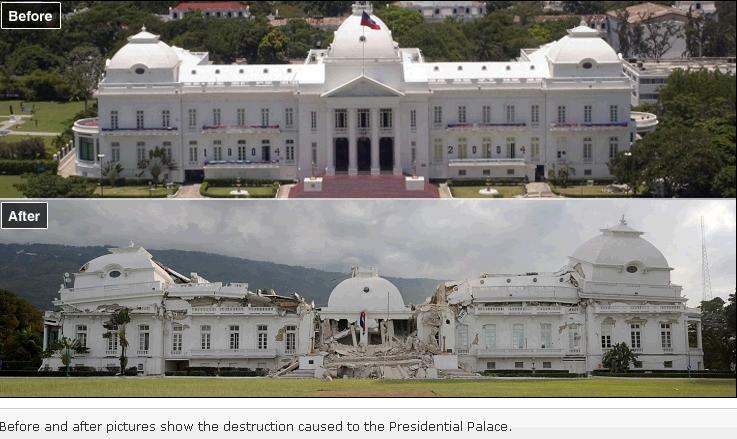 No, I had never been in the National Palace, but like the Getty station I had been next to when I heard the news, it was a building I passed four times daily on my way to and from work at the Haitian-American Institute where I taught English. That link goes to a whole new building. The building where I taught was an old mansion on the east end of the Champs-de-Mars on Rue Capois. Like the National Palace, it had collapsed – probably while evening classes were going on at the busiest time of day there. On July 4,1942, Haitians and Americans founded a bi-national center to reinforce friendship and cultural ties between their two countries. Located in the heart of Port-au-Prince, the Haitian-American Institute has enjoyed decades of continuous community service and remains faithful to the ideal of its founders. The Haitian-American Institute itself stands on a landmark site. The original building was the house that once belonged to former Haitian President Elie LESCOT. This building, pictured in the pen and ink drawing at the top of this page, was destroyed in the January 12, 2010 earthquake. It is a bi-national center run partially by the State Department. It’s great to see this grand new facility! In the old building, I loved teaching at six in the morning in the classroom on that very top floor. You could see the city waking up. I would walk up the many flights of stairs early just to go out on that balcony and watch for a few minutes before the students arrived. When Dr. Ainslie Minor was director, as was his position as Cultural Affairs officer at the embassy, he was often on the front steps to greet me and the arriving students prior to the early morning classes. We all loved him! He loved the institute and everything about it. We teachers were disdained by some subsequent directors until Millie McCoo arrived. She, too, loved the institute, the students, and the teachers. Passing the palace, on my way to work, I was usually on foot. I nodded to the guards in the guardhouse every day – several times a day. I later learned that the police headquarters adjacent to the palace had also crumbled to the ground. I was in there regularly on my annual trek through the ministries to renew my visas. All of those ministries were gone. So were the people in all of them. All the people in all of those buildings. My HAI and all of the government buildings. It was beyond my imagination, much the way the collapse of the twin towers had been on 9/11. I heard the news only one traffic light away from where, that September morning, I had heard that a plane had flown into One World Trade. How could it be? Who could have survived this? How on earth could my poor, dear Haïti Chérie recover? As I had over those “green weekends” in June 2009 when the Iranians were protesting their elections, I took to Twitter. A girl had texted, trapped in rubble beneath a supermarket that I knew. One where I had shopped. Many of us continually retweeted her location (and many others). 24 hours later, on the news, I saw her pulled out alive and well and wept. The reporter said they had found her from the tweets. That tarmac, where I had boarded and disembarked so many, many times was the tarmac where Hillary landed only five days after the worst disaster in memory in that country – the very first high foreign official to set foot on Haiti’s shaken soil after the quake. This was no photo op or campaign junket. 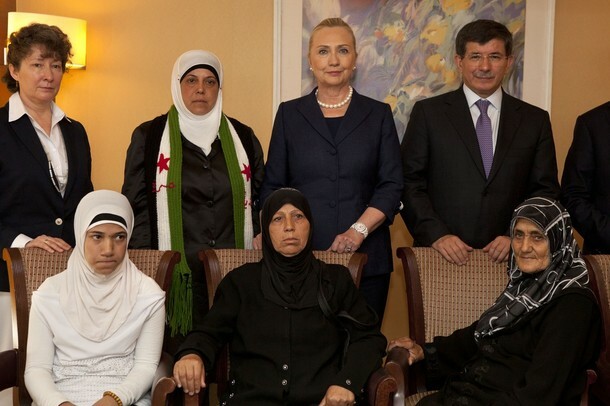 Hillary’s visit was from her heart. It was dangerous, responsive, and crucial. That, and much more was in my heart as I started reading this chapter and Hillary’s words about landing at the airport that, when I lived there, was named for François Duvalier and had undergone a major upgrade just before I left the country for good. Hillary was in Hawaii on her way to Asia when the quake – that came to be known as “Haitiquake” – occurred. Hillary had to change her plans. She flew back to D.C. immediately. She was at the White House the next morning and the pain was in her face … the terrible pain. I followed her progress to Haiti partially thanks to Greta Van Susteren who tweeted generously from the plane where she sat beside Andrea Mitchell and less so thanks to the old State Department Twitter that went by the handle “Dipnote,” which, in retrospect, was not so bad and pretty democratic. When Hillary landed I thought of her as really and truly “superwoman.” I am sure the Americans at the airport waiting to be evacuated thought of her that way too – or as an angel of mercy. She was landing on menacingly shaky ground. People who demand further service from her ought to consider the risks she has already taken, the sacrifices she has already endured, the time in the air and on sometimes dangerous foreign soil, away from her family. When does this “superwoman” get a chance to step back and let someone else take the reins? The guy with the argumentative comment on that post was wrong. She did come in by military transport, as I had predicted. She brought needed supplies and left the press entourage behind to bring injured Americans out. The purpose of her visit was to get an agreement from the President of Haiti to allow American military to take over the airport operations so that aid – waiting and blocked – could begin to flow. Sometimes, in a disaster, you must, judiciously, let one important visitor in for the greater good. Haiti was no textbook case. Who knew there was such a thing as a portable airport control tower? That is what the FAA sent and that would not have happened without Hillary’s intervention and visit, i.e. sometimes more is more. Over the course of some of those posts I heard from some aircraft experts that I had misidentified the plane as a C-130, but Hillary, in her book, validates me. Sometimes it takes years to be validated! My dad was an aircraft expert, not I. He built them and knew anything that was in the air that was not flapping its own wings. But once you have been floating on the Hudson River and seen a C-130 over your head on its way to Newburgh, you know one when you see one. It’s sort of like the Queen Mary over your head. 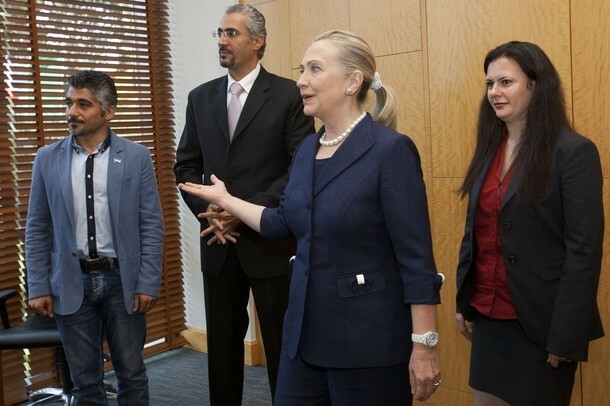 Hillary was accompanied by Cheryl Mills and USAID Director Rajiv Shah (2nd and 1st on the right respectively above). 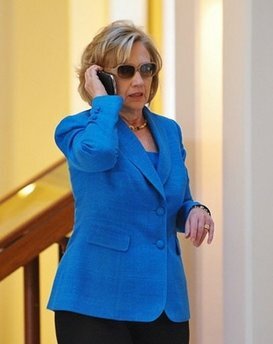 Cheryl, from what Hillary says, must have been the one who got the “people-finder” set up as well as the text system for sending donations easily from your cell phone. Rajiv was on the ground at the Champs-de-Mars in front of the collapsed National Palace where it seemed much of the Port-au-Prince population was camping out. I remember him finding some enterprising young folks who had managed to have two car batteries and one car. They had set up an enterprise allowing people, for a fee, to charge cell phones off one car battery while another of the crew ran a taxi service to charge the other battery. It was so Haitian! So this is where she starts – on the tarmac which is serving as the seat of government largely because it is flat and open and if you sit in a tent and there is a big aftershock you won’t be crushed. Most roads were impassable and for the first 48 hours, planes could not land at the airport. Hillary reminisces at this point about her honeymoon trip to Haiti when she and Bill went to one of Max Beauvoir‘s voudou shows at Le Péristyle in Mariani and saw TonTons Macoutes (VSN) and Jean-Claude Duvalier en route somewhere. 1975 was the first Christmas that I came back home – well to Florida where my sister was living. – or maybe I would have met them. After the earthquake, President Préval told Cheryl Mills that he really needed Hillary and needed her now! He was Hillary’s friend. He needed help. I perceived him as a nice guy, but not as a strong leader. 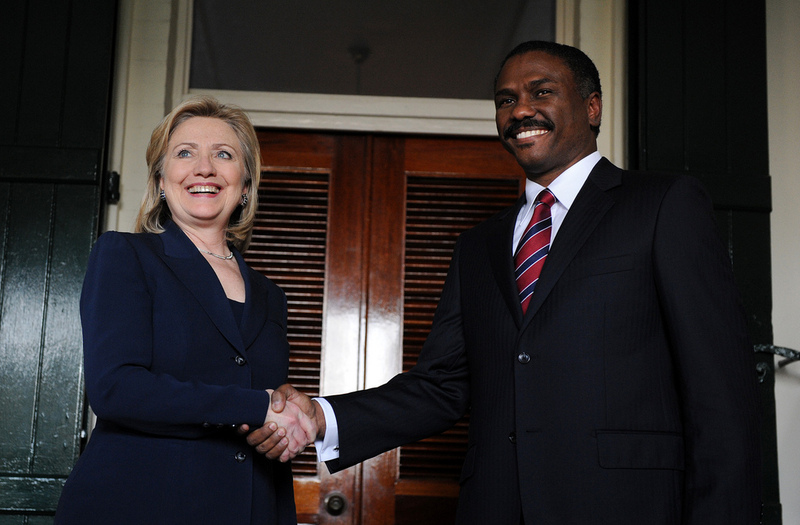 Hillary Clinton is NOT the President of Haiti! When you run for the office, before you even win, you need to consider this kind of situation and how you will react – even if you did just miss having your house fall on top of you. That is the role you assume as leader of a country. Try to imagine the White House or the Capitol this way. This is what happened to Haiti. When Hillary arrived, injured Americans were being cared for by a devoted embassy nurse who worked non-stop. Our Cultural Affairs officer, Victoria DeLong, had been killed when her house collapsed on her. I had been in that house several times on very happy occasions. Dr. Ainslie Minor and his lovely wife, and later Millie McCoo had generously invited the teachers to barbeques and parties. I had danced the merengue under that roof and met Millie’s sister and brother-in-law, Marilyn McCoo and Billy Davis Jr., there. Now that roof had killed a Foreign Service officer. There was a massive and effective U.S. response. 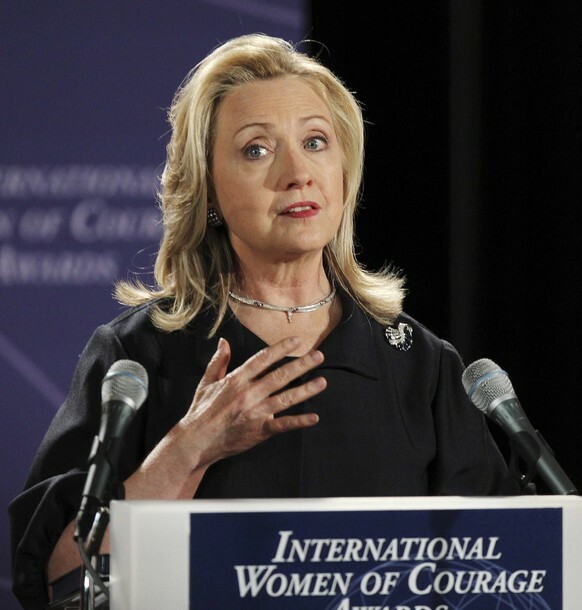 Hillary remarks that U.S. military felt so refreshed at being welcomed somewhere. One year we had no electricity from the last night of Carnaval in early February until about mid-June. The lights went out when Carnaval ended at midnight. From then on sectors got one hour of electricity a day on a rotating weekly basis. If you needed to do anything that required power, you needed to be home at your hour for that week. If you were working at that time … too bad. From Boutillier, the mountaintop above the city, you could see a sector darken and another light up on a clockwork schedule. Then the United States Marines arrived with generators and I don’t know what all else. I would be leaving my early morning classes at the institute (we taught from 6 -9 a.m. and from 3 – 6 p.m. or 4 – 7 p.m.) and they would be on the steps of the Hotel Plaza waiting to be picked up. We cheered them every time we passed them. “Thank you!” Our electricity was returning. Nice that after the earthquake the troops got the same reception. We have a sort of edgy relationship with Haiti as far as troops go. Americans built the best roads there – during the occupation. In this case, the distrust engendered by the history of the occupation could have been Préval’s political enemy. Yet to unblock the shipments of aid at the airport and seaports someone needed to be in charge – not to take over the country – just to lubricate the flow of aid. Hillary got Préval to sign an agreement that U.S. military would, temporarily in the emergency, administer the airport and seaports. Hillary Clinton is Wheels Up! The plan was to establish camps. Préval worried that putting displaced people in camps would make camps permanent. The U.N. contended that camps provided the best efficiency for necessary distribution of aid. To my mind, and this is just me, the camps were newer, safer, cleaner than the neightborhoods some people had come from, like Cité Soliel, but many were not from those slums, so there was something to be said on each side of the argument. For Haiti, the approach would involve both short-term aid and long-term plans for development that had already been in the incubator. 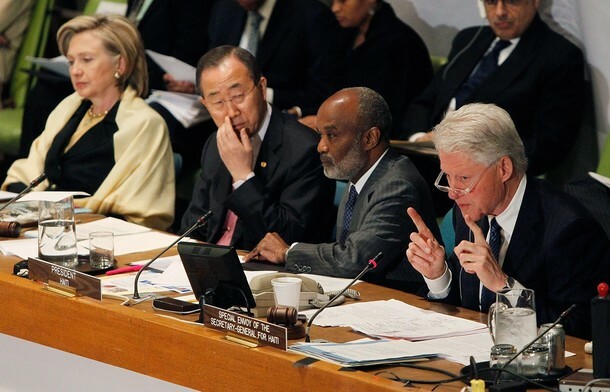 Today, Secretary Clinton announced that she will run an International Haiti Donors Conference in March at the U.N. You may remember her words at the Haiti Donors Conference last April in D.C. That speech was simply spot-on. We have had over 140 nations working to support the Government of Haiti in delivering food, temporary shelter, and medical care to thousands of survivors. But the emergency relief is only the beginning of what will be a long road to recovery, as the Secretary General just pointed out; one that will require global support. Before the earthquake, Haiti was on a path to progress. The government, led by President Preval, had started enacting critical reforms. 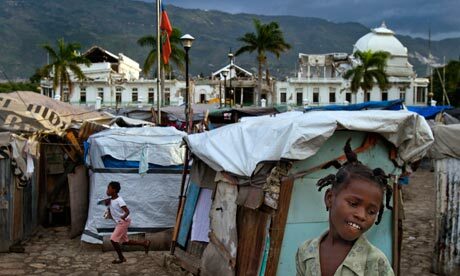 Haiti’s economy grew by nearly 3 percent last year. Two international chains launched new hotels, a sign of a rising tourism industry. New factories were opening and others had been contracted to begin production. But with the earthquake, the results of much of this hard work were wiped away. But the people of Haiti never gave up. As they mourn their losses, they gathered the resources they had left and began working around the clock to put their lives and their country back together. They relied on the strength and the spirit that have carried them through tough times before. But they need our help. 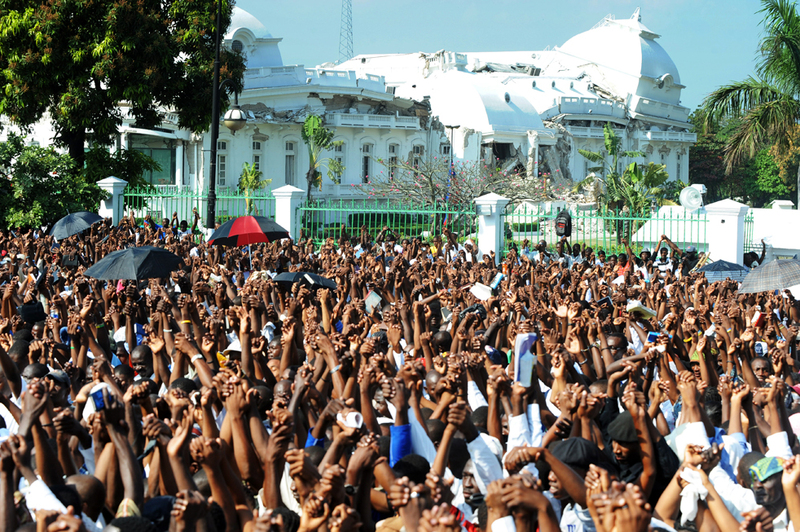 They cannot succeed without the support of the global community, and we need Haiti to succeed. What happens there has repercussions far beyond its borders. 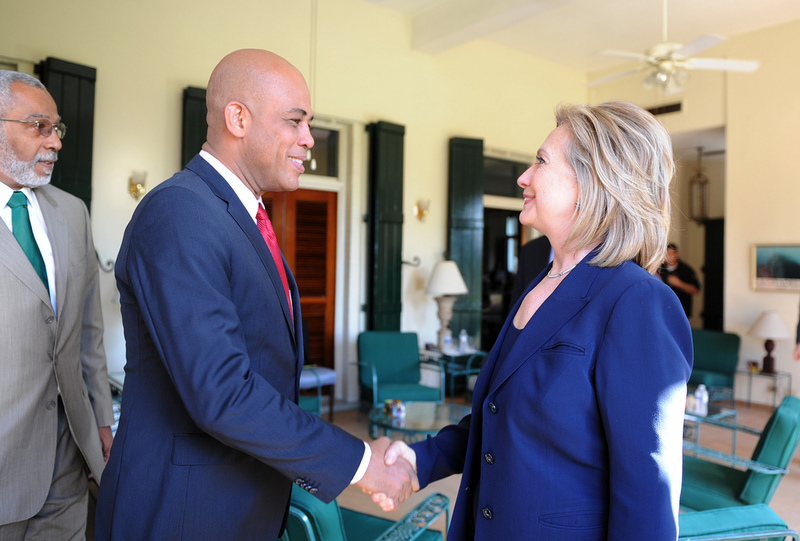 Hillary sees development as a key component in national security and USAID as an essential agency which played a huge role in addressing long-term plans to assist Haiti. She recounts the war against USAID waged by Jesse Helms and celebrates this initiative which she and Rajiv Shah initiated in 2011 and she proudly saw launched earlier this year. 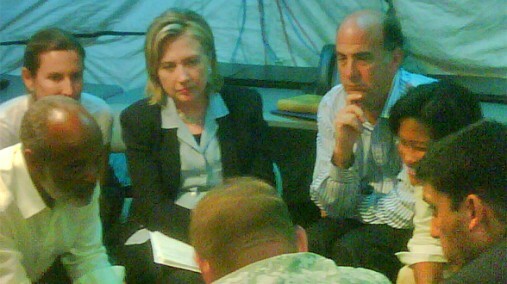 A year after the earthquake, Hillary returned to see the progress of the response (including to the subsequent cholera epidemic) and met with the presidential candidates. There remained many challenges but things looked greatly improved. 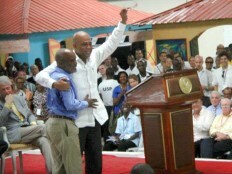 She recounts a personal moment with Préval after the disputed elections and credits him for being the exemplar – the first in Haitian history – to turn over the reins of leadership peacefully to a successor not of his backing but chosen by the people. When she speaks of the toughness of democracy, the danger of the running and the peril of the vote, my memory rewinds to the Aristede election when Haitians literally risked their lives at the polling places and some were, in fact attacked and killed just for trying to vote. This time, indeed, there was progress, and despite everything Préval might not have been, he, maybe, is their John Adams in some ways. 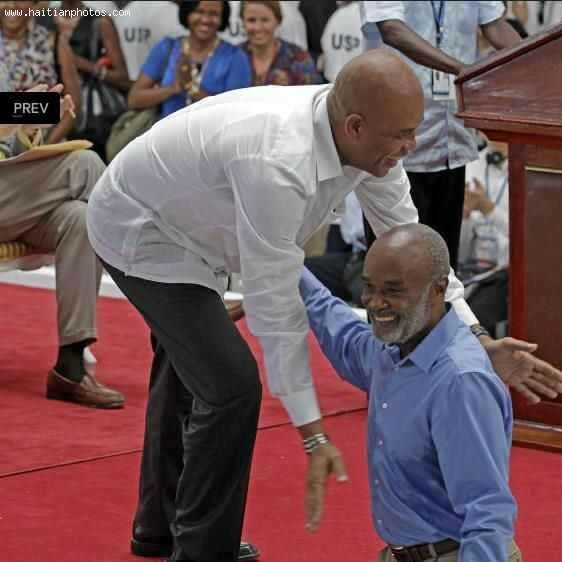 These images of the former and current presidents, Préval and Martelly, celebrating at the Caracol opening together were historic. In the book, Hillary provides a thorough and fair accounting of what has worked and what has not in the aftermath of this disaster. Shortly after she returned to the department following her health crisis in late 2012, this report was issued. Helping other nations build, profit, and rise among the economic powers on the globe is to everyone’s advantage, Hillary posits. Especially our own. 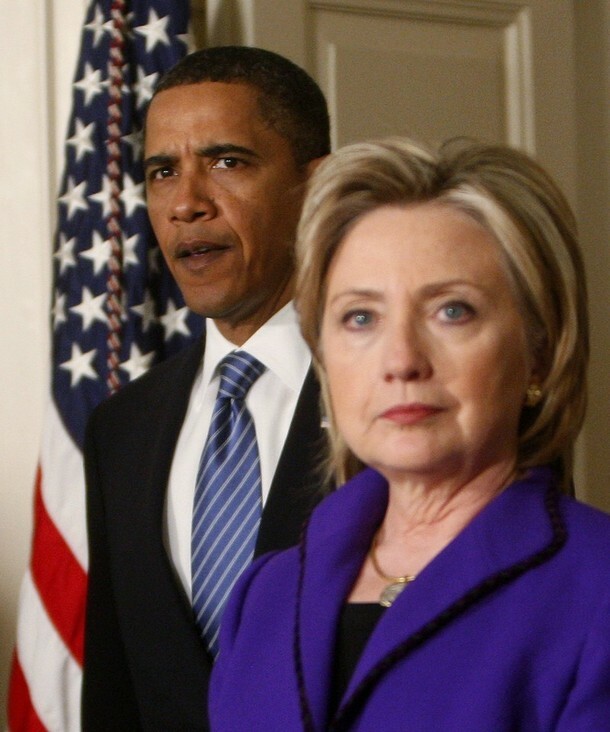 In the case of Haiti’s disaster, the U.S. was, it cannot be disputed, the indispensable nation, but we were certainly not alone in the aid or in the investment, and that, Hillary points out, makes all the difference. Today, the United States joins the international community to honor those who have lost their lives in humanitarian service and those who continue to bring assistance and relief to people in need. As the Syrian crisis carries on, we must continue to stand up for innocent civilians in the middle of a conflict they did not provoke. On a recent trip to Turkey, I spoke to refugees from Syria. Whether operating under the red of the Turkish flag, the blue of a UN vest or a local community member pointing the way to safety, every single person who helped them is a humanitarian. The men and women of humanitarian organizations put their lives on the line every day in order to provide life-saving aid to those in need. The average Turkish citizen may not have volunteered to be a humanitarian – they just happened to live near the crisis. But they have accepted their Syrian neighbors with open arms and have assumed the duty of protecting them. The same is being done in Jordan, Lebanon and Iraq. The United States is proud to be a leading donor to humanitarian efforts around the world, working with other governments, aid groups and international organizations to save lives and reunite people with their loved ones. But this work does come at a significant cost. We were reminded of that cost earlier this month when USAID Foreign Service Officer Ragaei Abdelfattah died in Afghanistan. His dedication to our humanitarian, economic, and national security efforts is an example of the highest standards of service. We were shocked and saddened by this loss. But we must continue the work that he so passionately believed in. 2012 has been designated by the UN as the year to say, “I was here”. We have all been challenged to do one good thing, somewhere, for someone else. From Syria to the Sahel, people of goodwill are finding ways to exemplify what it means to be a humanitarian. So let’s continue to stand up and speak out for those who cannot. Let’s redouble our efforts to this highest and noblest cause. 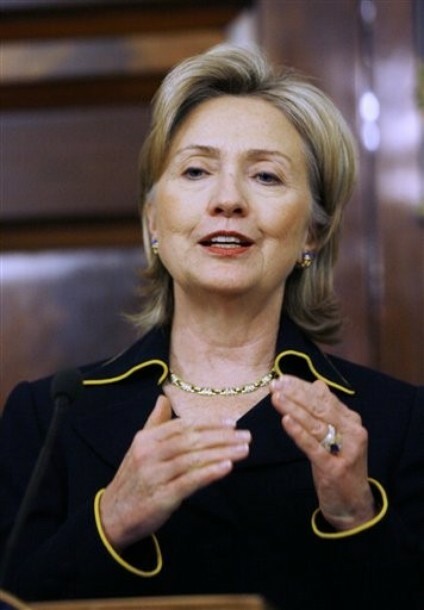 Secretary Clinton is on foreign travel to Qunu, South Africa and Johannesburg, South Africa. Secretary Clinton is accompanied by Counselor Mills, Assistant Secretary Carson, Spokesperson Nuland, Director Sullivan, Special Assistant to the President and Senior Director for African Affairs Grant Harris, and VADM Harry B. Harris, Jr., JCS. Please click here for more information. 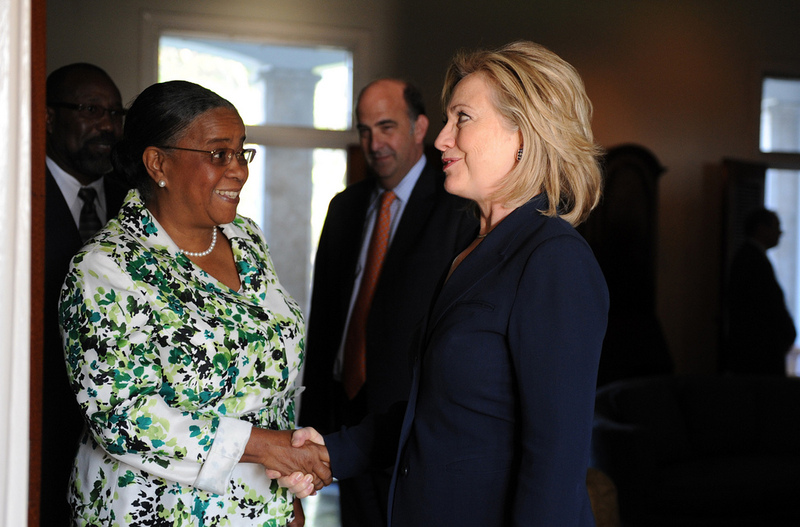 12:00 p.m. LOCAL Secretary Clinton meets with Nelson Mandela, in Qunu, South Africa. 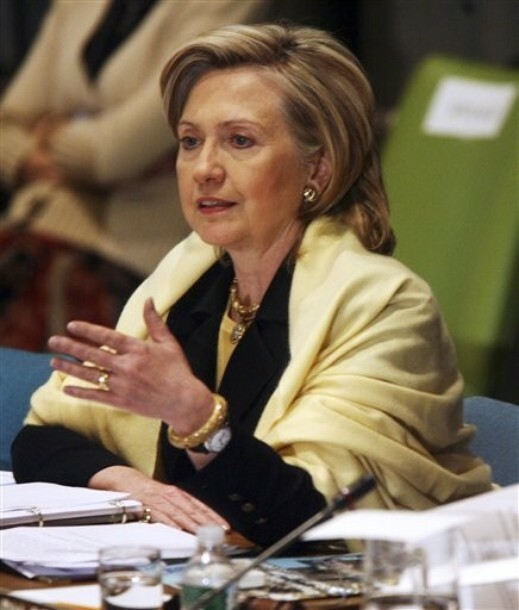 5:00 p.m. LOCAL Secretary Clinton attends the US-South Africa Business Partnership Summit, in Johannesburg, South Africa. 5:20 p.m. LOCAL Secretary Clinton meets with the staff and families of Embassy Pretoria and Consulate General Johannesburg, in Johannesburg, South Africa. Good morning. It is such an honor and a pleasure for me to be here, and let me begin by thanking the Foreign Minister. We are very proud that you were educated in part in our country, and we are very pleased to see you in this position. And I thank you for quoting one of my favorite sayings and admonitions about what we are to do with our time on this earth. And I am grateful to you, Foreign Minister Cisse. Let me also thank President Ndiaye for that warm welcome to this distinguished university. I have been looking forward to being here, a place that has trained so many of the leading citizens of Senegal and of West Africa, and to have this opportunity, joined by a broad cross-section of Senegalese society – government officials, religious leaders, members of the business community and civil society, young people and students, everyone representing the rich mosaic of democracy in Senegal. I have many fond memories of my first trip to Senegal with my daughter, Chelsea, in 1997. And already last night and today, I have met people who I met for the first time during that visit. I met so many impressive and courageous men and women working to improve rural health, to protect the health of your girls, to be on the forefront of developing the economy. Even then, 15 years ago, I felt the promise and the potential that you were realizing, and I was so excited. He followed through on that pledge with initiatives like the African Growth and Opportunity Act, which began opening U.S. markets to African goods, beginning to shift the focus of our relationship from aid to trade. His successor, President George W. Bush, first visited Senegal and other African nations in 2003. And he too was committed to deepening the partnership between our nations. Under President Bush’s leadership, the United States launched two landmark programs – PEPFAR to fight HIV/AIDS, and the Millennium Challenge Corporation to link our assistance with improvements in governance and accountability. President Obama also acknowledged that historically, Western powers had too often seen Africa as a source of resources to be exploited or as a charity cause in need of patronage. And he issued this challenge to Africans and Americans alike: Africa needs partnership, not patronage. And we have tried to build on that challenge. And throughout my trip across Africa this week, I will be talking about what it means, about a model of sustainable partnership that adds value rather than extracts it. That’s America’s commitment to Africa. The Obama Administration’s comprehensive strategy on Sub-Saharan Africa is based on four pillars: first, to promote opportunity and development; second, to spur economic growth, trade, and investment; third, to advance peace and security; and fourth, to strengthen democratic institutions. Our partnership with Senegal embodies all four of those pillars. First, when it comes to development, we are building on the progress of programs like AGOA, PEPFAR, and MCC, and incorporating the lessons learned over the past decades. We are pursuing what is called country ownership of development. That means a nation’s own efforts to lift your own people out of poverty, improve health and education, grow your economy, are led, planned, and ultimately implemented by your own government, your own communities, your own civil society, your own private sector. Now, I know that in some quarters, the phrase “country ownership” raises questions. Some worry that it means donors are supposed to keep money flowing indefinitely while a handful of unaccountable ministers pick and choose how to spend it, or conversely, that it is code for abandoning our partners. Still others fear that country-owned really means government-run, freezing out civil society and the private sector. Now, we also believe that good governance and political will matter. Sustainable development hinges on political leaders making good choices to fight corruption and to create jobs, to prioritize investments in health and education, to put in place fair tax systems, transparent budgeting, and other responsible measures. And I heard from the President in our very constructive, comprehensive meeting earlier today about the steps that he is taking in every one of these categories. Because this goes beyond the portfolios of health or development ministers. It takes leadership from the top. And so I raised these issues with prime ministers and presidents, also with civil society, also with the private sector. But ultimately, in a democracy such as Senegal’s, the decisions should lie with the people, with people exercising their rights of citizenship to get the kind of services that you know you need for yourselves and your families. We welcome President Sall’s focus on transparency and accountability in government and on independence for the judiciary. We believe his plans to boost agricultural production and reform land ownership rules will be very important. We also wish to help him fulfill his pledge to resolve the long-running conflict in the south. (Applause.) And we are committed to help in every way with the prosecution of former President Habre of Chad. All of these commitments are important ones that speak to the kind of government and country that Senegal is and intends to be. And the United States stands ready to help, as a partner and a friend. The foundation for our investments in Senegal is a $540 million Millennium Challenge Compact, one of the largest in the world. Here is what it is intended to do based on the very tough competition that Senegal had to go through in order to receive this grant. It is helping Senegal improve roads, build bridges, irrigate some 90,000 acres of farm fields, make it easier for farmers to get their products to market. In addition to that, this year, the United States Agency for International Development is investing $19 million to build schools and train teachers, $17 million to strengthen the food supply, $55 million to improve public health. I saw the public health money in action at that health center this morning, because what I saw was a well-organized plan that put in one place the services that people will need. Now, that may sound obvious to you, but Senegal is leading in this area. Too many countries still have health services scattered all over. So if you’re a pregnant woman who goes for a checkup, but who also wants to get a bed net for malaria protection, you have to go two different places. But at this health center based on the model that Senegal is building, it’s more efficient, and it produces results faster. Working together, Senegal has driven child mortality down by 40 percent over the past five years. But there is still more work to be done. The second pillar of our strategy is spurring economic growth, trade, and investment. Trade between the United States and Senegal rose 20 percent last year. We are really beginning to make progress, but as I told the President, we know there’s more we must do to get that number even higher. The IMF recently reported that Senegal’s democratic resilience has positioned you to achieve long-term growth, and the United States wants to be part of your success. Indeed, we believe – (applause) – that if you want to make a good investment in the midst of what is still a very difficult global economy, go to Africa. In Africa, you have seven of the ten fastest-growing economies in the world. But too many businesspeople around the world don’t know that. So we’re going to do more to try to make sure businesses and investors in the United States know about the opportunities in Senegal and elsewhere across Africa. (Applause.) But in order to be meaningful, it’s not just the numbers and the statistics that count. Growth needs to be translated into widely shared prosperity. It will not be a success if a small group of people get richer. What you want to see is sustainable inclusive growth over the long term. And I will be making that point everywhere I stop. The third pillar is a commitment to shared security and regional problem-solving. And here, too, the United States and Senegal are working together closely, working to combat terrorism, tackling regional threats such as drug trafficking, supporting peace and security throughout the region and the world. And I especially want to applaud and thank Senegal for your contributions to peacekeeping missions from Cote d’Ivoire and the Democratic Republic of the Congo all the way to Haiti. I hear many compliments about the professionalization, the expertise of the Senegalese military. (Applause.) And we, for one, thank you for that. With Senegal’s participation, the Economic Community of West African States, ECOWAS, has also become a leader in responding to political and security crises. ECOWAS stood up for democracy by opposing the illegitimate Gbagbo regime when it held on to power after losing the election in Cote d’Ivoire. It’s coordinating regional responses to transnational threats such as narcotics, piracy, and small arms trafficking. And we are working together to train police, prosecutors, and security forces to help strengthen the rule of law and uphold human rights. It’s especially appropriate to emphasize the fourth pillar of our approach here in Senegal because it is the heart of the American model of partnership, and that is our enduring support for democracy and human rights, our helping other nations and people fulfill their own aspirations. By every measure, democracies make better neighbors and better partners. They are more capable of working together to solve shared challenges. They innovate more. They give people a way to devote their energies to productive political, economic and civic engagement, which reduces the allure of extremism. And open societies offer more opportunities for economic, educational, cultural, and people-to-people exchanges, which are the foundation for peace. Now, I know there is sometimes an argument that democracy is a privilege belonging to wealthy countries, and that developing economies must put economic growth first and worry about democracy later. But that’s not the lesson of history. Over the long run, you can’t have effective economic liberalization without political liberalization. Without the rule of law, people with a good business idea or money to invest cannot trust that contracts will be honored and corruption punished, or that regulations will be transparent and disputes resolved fairly, and so many will end up looking for opportunities elsewhere, some even migrating out of their countries of origin. Last year, the World Bank reported evidence that respect for economic freedom and civil and political liberties helps explain why some countries achieve better long-term economic outcomes than others. So instead of viewing democratic reform as an afterthought, we see it as key, a key building block of sustainable development. And on a personal note, I have to add – I was particularly impressed that Senegalese voters elected women to 65 of the 150 seats in the new National Assembly. (Applause.) You probably know this, but that gives Senegal one of the highest percentage of women in directly-elected legislative bodies in the world. (Applause.) And of course, it makes perfect sense because democracies must be open to and include all of their people, men and women, not just to vote, but to have the chance to participate and to lead. And Senegalese women took a leadership role during the voting, including the Women’s Platform for Peaceful Elections, a network of more than 60 organizations. And the Situation Room, which was such an important clearinghouse – (applause) – it was such an important clearinghouse for information and activism that President Sall made it a point to visit the first day after his victory was announced. Now sustaining this participation will be critical in the days ahead, because you know things cannot happen overnight. It takes time. But you have a leadership that you have elected that has made public commitments to the changes that you want them to make. And I know from our own work with your new leadership they are absolutely committed to see those changes happen. (Applause.) So we will stand with them and with you as you begin the hard work of translating into reality and results the rhetoric of what happens in a political campaign. Now the resilience of democracy is being repeated across the continent. We’ve seen the restoration of constitutional order in Niger and Guinea following coups. We’ve seen credible elections in Benin, Cape Verde, Liberia, Nigeria, Zambia, and Togo over the last year alone. We’ve seen freer media, fairer justice systems, more effective legislatures, more vibrant civil societies. Take Cote d’Ivoire, for example, which last year had to fight off a serious threat to democracy and this year is reaping the economic rewards. The World Bank, the IMF, and the Paris Club have agreed to forgive nearly $4 million in debt – $4 billion in debt. And whereas their GDP declined by more than 6 percent in 2011 during their crisis, it’s expected to soar by more than 8 percent this year. And Cote d’Ivoire, because they are now at peace and democratic order has been restored, has been able to unlock global financing for long-delayed infrastructure projects, including new bridges, hydroelectric dams, and much more. So democracy and peace pay off. This week, all of us join the people of Ghana in mourning the passing of President Mills, a good man and a good leader for his country. (Applause.) But we are also celebrating the smooth, peaceful, constitutional transfer of power to President Mahama. The Ghanaian people will head to the polls later this year and will have an opportunity to add another accomplishment to one of Africa’s great democracy stories. Earlier this year, I had the privilege of attending the second inauguration of President Ellen Johnson Sirleaf in Liberia, a country that only recently emerged from years of war and economic ruin. There were troubling signs that this last election might reignite the flames of conflict, but Liberia’s leaders and its young, democratic institutions proved strong and kept the country on track. Now I know how hard it can be to keep faith in a democratic system when your preferred candidate or party loses an election. I’ve won elections and I’ve lost elections. I know that boycotting or obstructing is no way to advance an agenda or to solve a problem. It’s a recipe for gridlock and conflict. I’m often asked, all over the world, how I could agree to serve in President Obama’s Cabinet after we had campaigned so hard against each other. I was trying to beat him, he was trying to beat me, and he succeeded. And I always give the same answer: Because we both love our country. (Applause.) Because that’s what democracy is all about, and that’s what patriotism is all about. And you know that here in Senegal. And we hope to see that spirit and experience take hold in many more countries in the region. Because as proud as we are to see the successful elections and the peaceful transitions, there are still too many places in this region and across the continent where democracy is threatened, where human rights are abused, where the rule of law is undermined. There are still too many Africans living under autocratic rulers who care more about preserving their grip on power than promoting the welfare of their citizens. 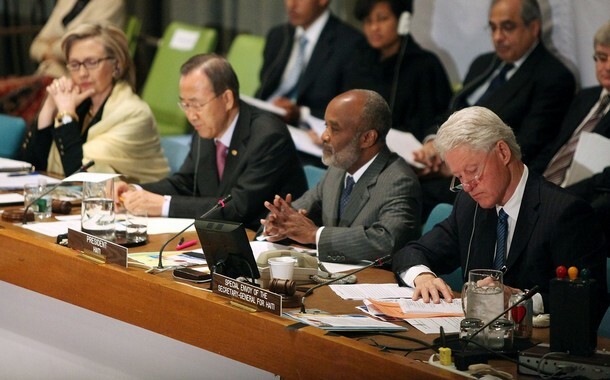 Violent extremism, transnational crime, and rampant corruption all threaten democracy. And we have seen some backsliding because we have seen that in less than a decade, the number of electoral democracies in Sub-Saharan Africa have fallen from 24 in 2005 to just 19 today. Now, that’s far better than it was 20 years ago, but not nearly good enough. And here in Senegal, there are some worrisome developments in your neighborhood. In Guinea-Bissau, no elected president has successfully served a full five-year term, and this past April a military coup once again disrupted constitutional rule. And we thank Senegal for contributing troops to the ECOWAS stabilization force there. The already weak economy is collapsing. Cashew production is forecast to drop by half. But what is growing? Drug trafficking. Rampant corruption, greed, is taking over. And we see a very troubling trend, that Guinea-Bissau, unless the people of Guinea-Bissau with the help of their neighbors and the international community say no, could become a totally dependent state on drug traffickers from Latin America. What a terrible development. The President and I talked at length about what more we could do to help, and we stand ready to do so, because the people of Guinea-Bissau certainly deserve better. Mali was, by most indicators, on the right path until a cadre of soldiers seized power a little more than a month before national elections were scheduled to be held. By some estimates, this could set back Mali’s economic progress by nearly a decade. It certainly created a vacuum in the North in which rebellion and extremism have spread, threatening not only people’s lives and the treasures of the past, but the stability of the region. And recent reports from Human Rights Watch raises concern about alleged torture and extra-judicial killings at the hands of the mutineers. Now the interim President has returned and we encourage all parties to set aside their differences, work to restore democracy, schedule elections by April of next year, preserve the territorial integrity of the country, reject the appeals of violent extremism. The African Union has suspended Mali, ECOWAS has imposed sanctions, the United States is holding back funding, and we’ve continued critical humanitarian assistance for programs in health and food, and we’re contributing $10 million to assist the more than 260,000 Malian refugees who have been displaced. And we’re well aware of the greater food crisis across the Sahel, and we’re getting more than $355 million to try to address the food and refugee crisis across the Sahel. I’ve also dispatched some of my top aides to work with the UN High Commissioner for Refugees to go to Mali, to go to Burkina Faso, and elsewhere to assess further what the needs are. But we cannot and will not resume assistance to the government until the military accept civilian control and a democratically-elected government once again takes office. Now, Mali and Guinea-Bissau are just two examples. There unfortunately are more. And in places where jobs are scarce and a tiny elite prospers while most of the population struggles, people – especially young people – can turn their frustrations into social, economic, and political change. That’s the right channel. But they can also be attracted to violence, to conflict, to extremism out of frustration and anger at what they see happening around them. So the links between democracy and development is a defining element of the American model of partnership. And I acknowledge that in the past our policies did not always line up with our principles. But today, we are building relationships here in West Africa and across the continent that are not transactional or transitory. They are built to last. And they’re built on a foundation of shared democratic values and respect for the universal human rights of every man and woman. We want to add value to our partners, and we want to add value to people’s lives. So the United States will stand up for democracy and universal human rights, even when it might be easier or more profitable to look the other way, to keep the resources flowing. Not every partner makes that choice, but we do and we will. I also acknowledge that some people back in the United States say we shouldn’t bother, that we should just focus on America’s immediate economic or security interests, not worry so much about the slow, hard work of building democracy elsewhere. But I think that is shortsighted. It’s not only in what we see to be the interest of the people of Senegal and elsewhere, it’s also in our interest to have strong and stable partners in the world, and democracies are by far the strongest and most stable partners. So this isn’t altruism. This is a strategic commitment to shared prosperity, to common security. During the recent elections here, many young people and students talked of a new type of Senegalese citizen emerging – active, engaged, committed to democracy. Well, that’s the kind of partnership we want with you, and particularly with your young people. This is a young country, and this is a young continent. (Applause.) And we know that young people are now connected to each other in ways that were not imaginable just a few years ago. A young student here at this university knows what’s happening not only in South Africa, but in South Asia. You can see what other people are doing, how they’re participating, and you begin to say to yourself: What about our talent? What about our potential? What about our future? I am here to tell you we believe in the young people of Senegal and the young people of Africa. (Applause.) And we believe that talent is universal, but opportunity is not. So what does that mean? We believe that right now somewhere in Senegal a young boy or a young girl could be a scientist that helps discover a cure for a rare form of cancer – (applause) – could be a president in 30 or 40 years, could be an entrepreneur that creates a new business that employs hundreds, even thousands – (applause) – of other Senegalese. We believe that. And we believe the best way to test that is to do what Senegal is doing, to keep doing the hard work of education, of healthcare, of development, and especially in the rural areas, of gender parity, so you don’t lose the talents of half the population of Senegal – (applause) – as you build this new future. We want to advance your aspirations and our shared values. We want to help more people in more places live up to their own God-given potentials. We want this to be our mutual mission. That is the work we are called to do in the 21st century. It is a race, a race between hope and fear, a race between potential realized and despair imbued in every pore of one’s body. It is a race that we are in between those who believe as you and we believe, that there is an unlimited future for those who are willing to work together. A year ago, the world witnessed unspeakable tragedy as the Great East Japan Earthquake took thousands of lives, and battered a nation. But through the resilience and courage of the Japanese people, Japan lifted itself out of the wreckage and began to rebuild what was lost.In the wake of that disaster, the United States was eager to assist by providing support for Japan’s Self-Defense Forces and civilian responders. Today, as the recovery moves forward, we are committed to Japan’s future and to this important partnership and alliance. The ties between our two countries are strong and enduring, and we look to Japan as an important regional and global leader. Even while rebuilding at home, Japan has continued to be an unwavering voice in the international community. Whether promoting democracy in Burma and the Middle East, providing assistance in Afghanistan and Iraq, or working to curb violence and piracy in the Horn of Africa, Japan is taking on some of the most pressing issues of our time. In the years to come, I hope that the bond between our countries will grow stronger as we work together to meet new challenges and explore new opportunities. Today, as we remember all who were lost a year ago, we reaffirm that deep and lasting friendship. Today, we honor women from all corners of the globe and the unique contributions they make. For over one hundred years, International Women’s Day has been a beacon of hope for so many women on the frontlines of progress who have fought to lift up their communities, their societies and change our world. We have made enormous progress in recent history. In the last year alone, women have marched, blogged, tweeted, and risked their lives all in the name of dignity, rights, and opportunity. Last October, the Nobel Committee took the historic step of awarding the Peace Prize to three extraordinary women for their contributions in advancing human rights. But challenges still remain. Too many women have found their attempts to participate in government, in the economy, and in society blocked. Women still disproportionately suffer from poverty and violence. Their voices are muffled and their presence denied at the places where critical decisions are made. They face nationality laws that deny them equal rights to citizenship. And women and girls are all too frequently deprived of access to reproductive healthcare, education, and the credit needed to launch small businesses. That is why the Obama Administration is accelerating efforts to advance and institutionalize women’s participation in making and keeping peace, including the launch of a U.S. National Action Plan on Women, Peace, and Security. And that’s just the beginning, because around the world, from Iraq and Afghanistan, to South Sudan, to the new transitional democracies in the Middle East and North Africa, our embassies are developing local strategies to expand political, economic, and social opportunities for women. The United States is committed to making women and their advancement a cornerstone of our foreign policy not just because it’s the right thing to do. Investing in women and girls is good for societies, and it is also good for the future prosperity of countries. Women drive our economies. 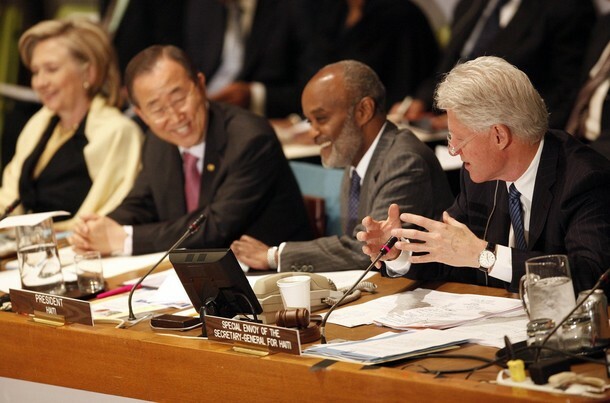 They build peace and prosperity and political stability for everyone—men and women, boys and girls. So let us recommit ourselves to a future of equality. Together, we can ensure that all people everywhere have the opportunity to live up to their God-given potential. December is always heavily front-loaded, and 2011 was hardly an exception with Mme. Secretary on an historical visit to Burma where she met extensively with Nobel laureate and opposition leader Dai Aung Sang Suu Kyi. Cameras popped, literally, for days and Mme. Secretary granted a flurry of media interviews. Looking scrumptious, she touched down in DC for a meager 36 hours to host her traditional Kennedy Center Honors Gala Dinner, and was off again. This time for Europe – a Rainbow Tour beginning in Bonn for an Afghanistan Conference. After Bonn, it was Vilnius, Lithuania for the Organization for Security and Cooperation in Europe (OSCE) conference followed immediately by a visit to Geneva, Switzerland, There she met with the Syrian National Council, delivered a Human Rights Day speech that electrified as well as an address at the Biological and Toxin Weapons Convention. In Brussels she spoke at the NATO Conference, and then moved on to The Hague where she attended a Conference on Internet Freedom. The earth lost a dictator and a hero when North Korea’s Kim Jong-Il and former Czech president Vaclav Havel died. Mme. Secretary led the US delegation, including former President Clinton and former Secretary of State Albright to Havel’s funeral in Prague. As the year drew to a close, the calls for Secretary Clinton to run for POTUS in 2012 escalated into a write-in campaign for primary states, NH first, complete with robocalls. As of two nights ago, HRC was on Americans Elect. As my friend Rumana told both President and Secretary Clinton, we are very serious about this and will continue to pursue this effort into the new year. We hope our encouragement touches Mme. Secretary. Speeches: Remarks at the Afghanistan Conference, Remarks at Breakfast with Afghan Civil Society Representatives, Afghan Women’s Event, Afghanistan Conference First Working Session, Belarus Civil Society Roundtable, Civil Society Meet and Greet, OSCE First Plenary Session, Human Rights Day speech, Biological and Toxin Weapons Convention, Conference on Internet Freedom, Women in Public Service, ICG Dinner: “In Pursuit of Peace,” To Walk the Earth Safely. Travel: Burma, Germany, Lithuania, Switzerland, Belgium, the Netherlands, the Czech Republic. Our best wishes, Mme. Secretary, for a Happy, Healthy, Safe, and Successful 2012. We implore you. Run, Hillary, run!